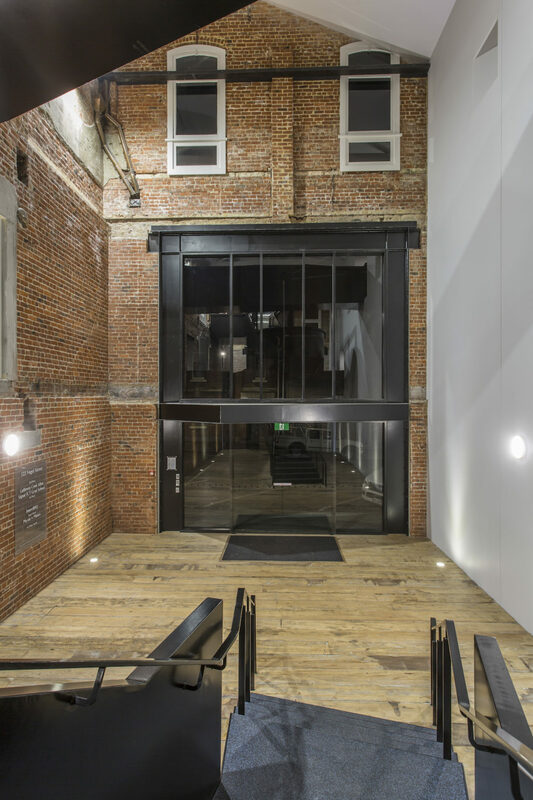 The owner of a historic wool store in Dunedin asked Rexel for help with lighting for the building's restoration. Number 123 Vogel Street is a two-storey building with a 4 meter stud, kauri beams, trusses and floor timbers, and double brick walls. The ground floor was tenanted but the first and second floors were empty and rundown. The owner wanted to restore the building while respecting its history, using light to draw attention to the architecture. The challenge of this project was to ensure appropriate, comfortable levels of task light, staying in keeping with this heritage building. 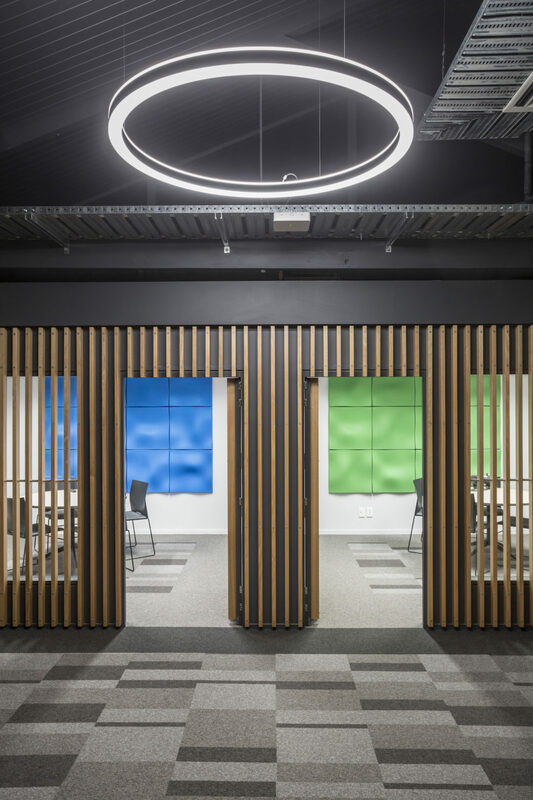 In the boardroom the designers created a large rectangular pendant to match the window frames and the line of white plaster that runs through the walls. 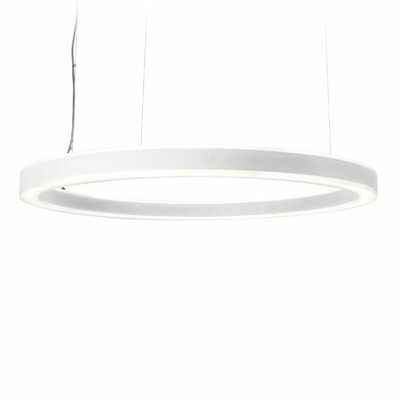 This pendant, Planlicht Pure 2 LED, follows the lines of the table and is mirrored by a carpet inlay for symmetry. The main architectural feature of the interior is a foyer which spans the building. This was lit using a mix of wall lighting and downward light to overcome the 11 meter ceiling height. 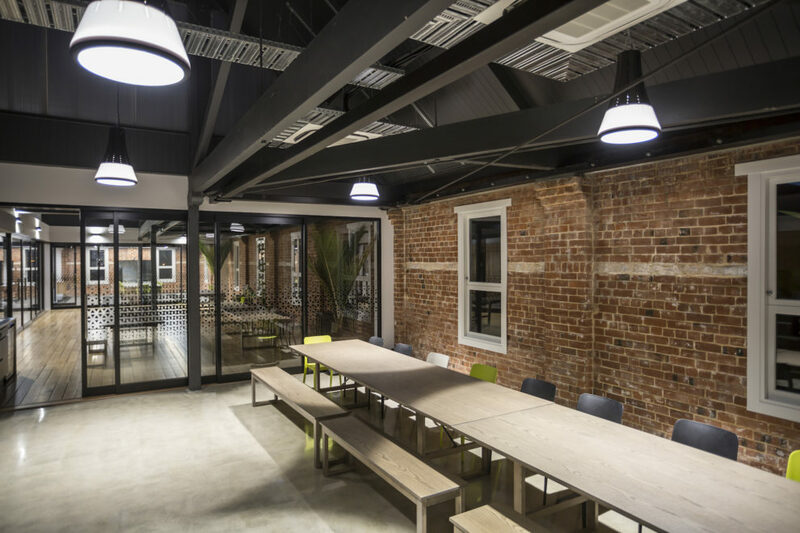 The second storey tenancy of 123 Vogel Street was developed for one of Dunedin’s oldest law firms, Galloway Cook Allan solicitors. 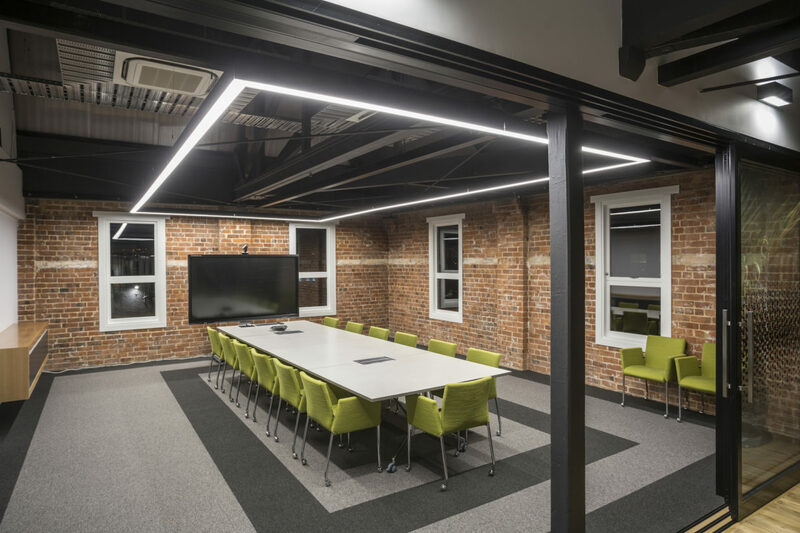 The architect’s brief was to highlight the building’s original features while adding some drama with the lighting, and for the partners and staff to have good usable lighting for task work. 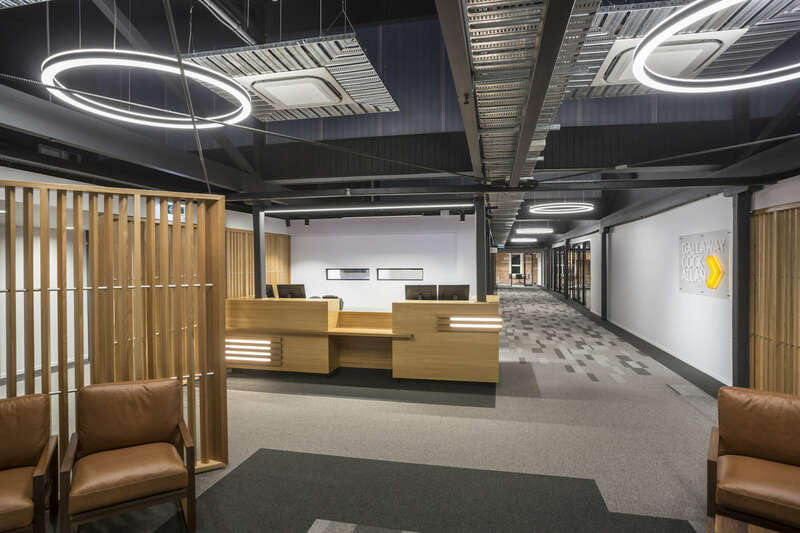 The lighting design for Galloway Cook Allan was split into two zones. The first area was the main client entrance, reception, meeting rooms, cafeteria, and board room. 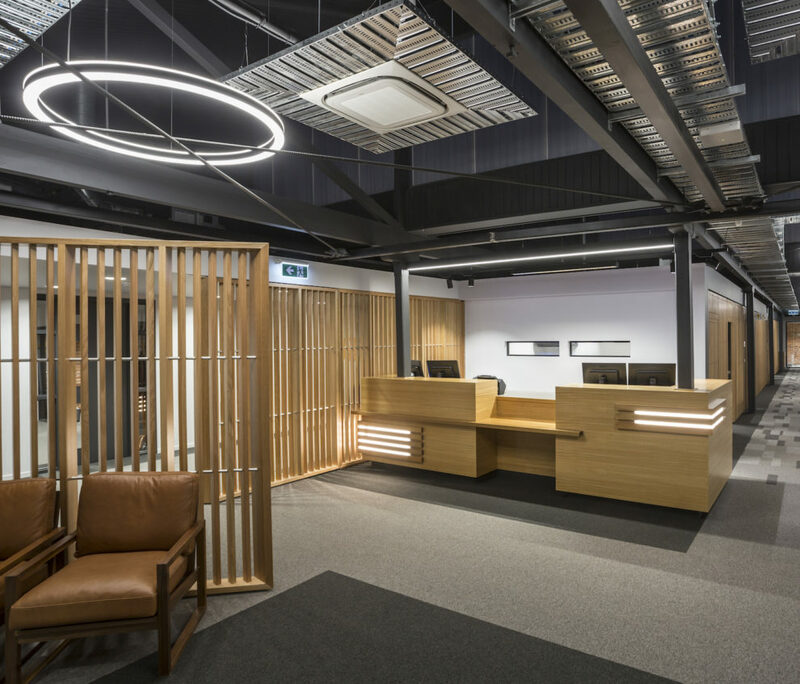 The second lighting design zone in this tenancy was the partners and staff area. 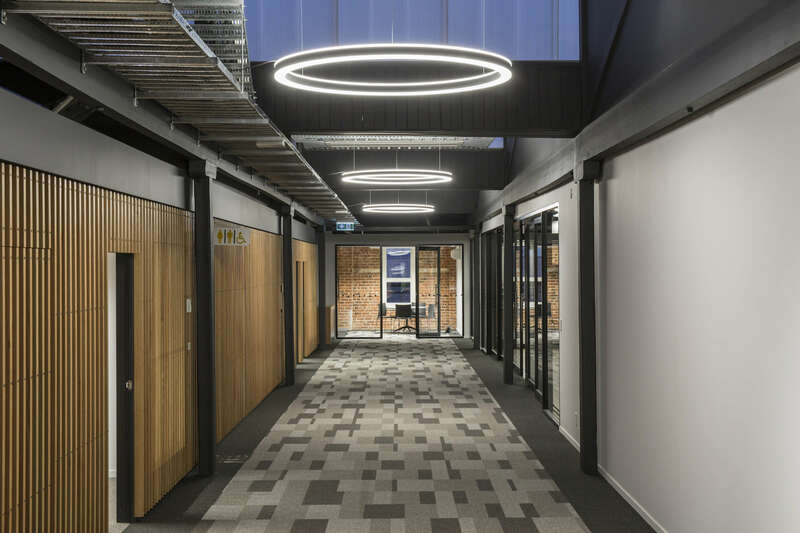 This area was lit using suspended three-circuit track with a mix of OMS Avior spotlights and OMS Lambda louvred linear fittings attached to the track. This allowed flexibility of design and future-proofed the areas for later changes of use. 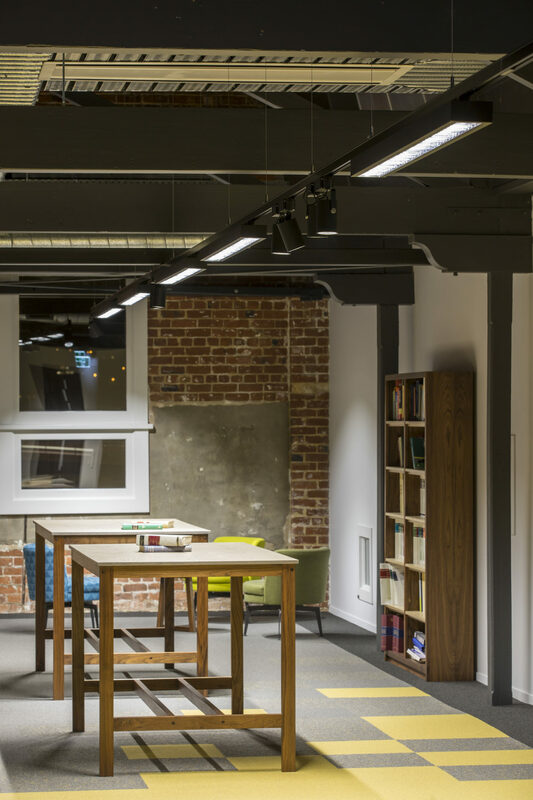 The challenge of this project was to ensure appropriate, comfortable levels of task light, without it looking out of place in this heritage building. The resultant lighting enhances and highlights the sometimes rough and industrial surfaces, Light grazes the walls and leaves gentle scallops of light creating contrast. The clients, partners and staff are very happy in their new repurposed piece of history. The surrounding warehouse district has been earmarked by the Dunedin City Council as an area of significant heritage and they are encouraging restoration of further buildings. With a fitout that is sensitive to the building’s history, 123 Vogel Street is a benchmark for other developments. 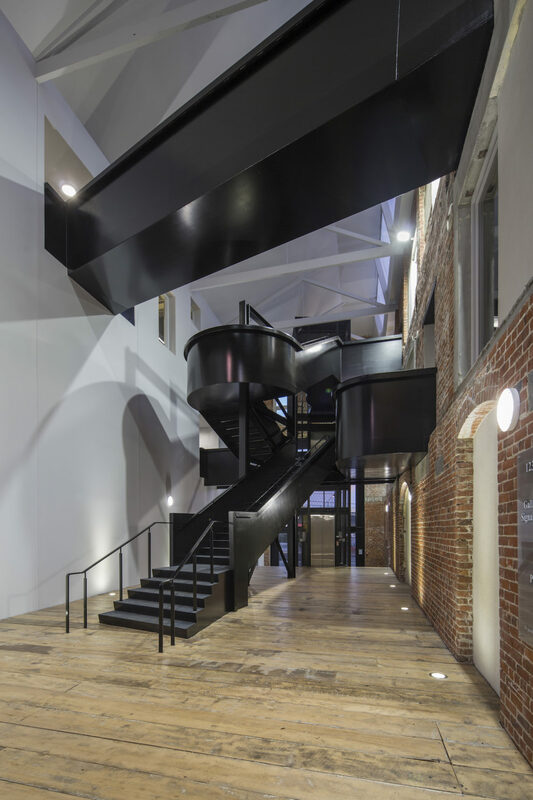 In the foyer is a modern suspended staircase made of solid steel with very large feature windows either side. This area was lit with wall-mounted downward light to achieve good light on the horizontal surfaces. 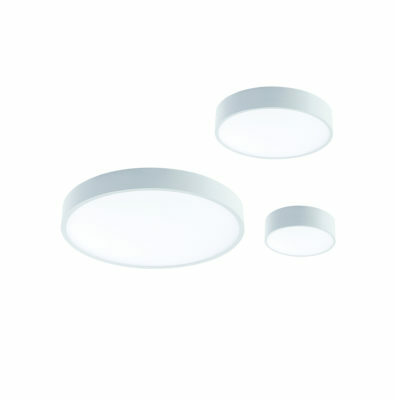 The ambient light was augmented with wall-mounted fittings to supply both vertical illuminance and emergency lighting. Uplights were recessed into the wooden floors to highlight the texture of the brick walls. 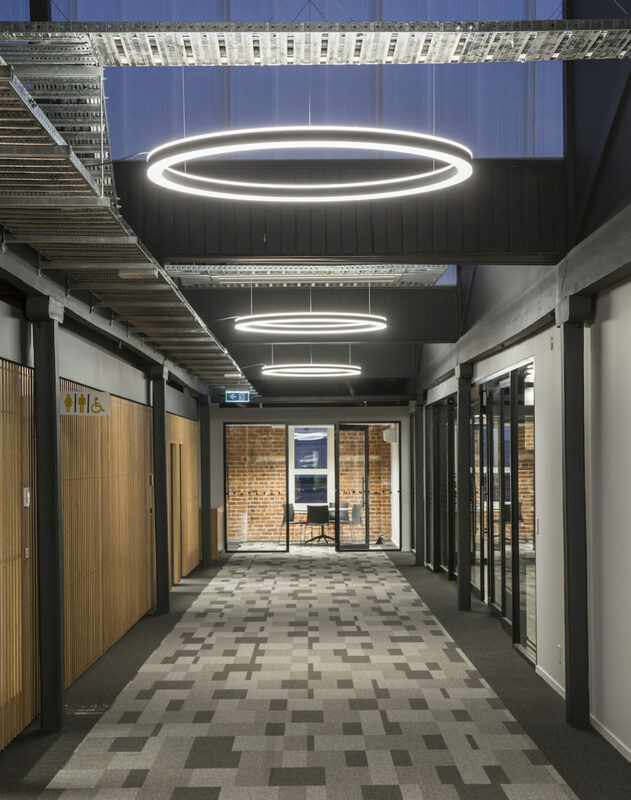 The reception area and hallway were wide generous spaces, so the designer accentuated this feeling of openness by using large circular Planlicht fittings with a 1.5m diameter. 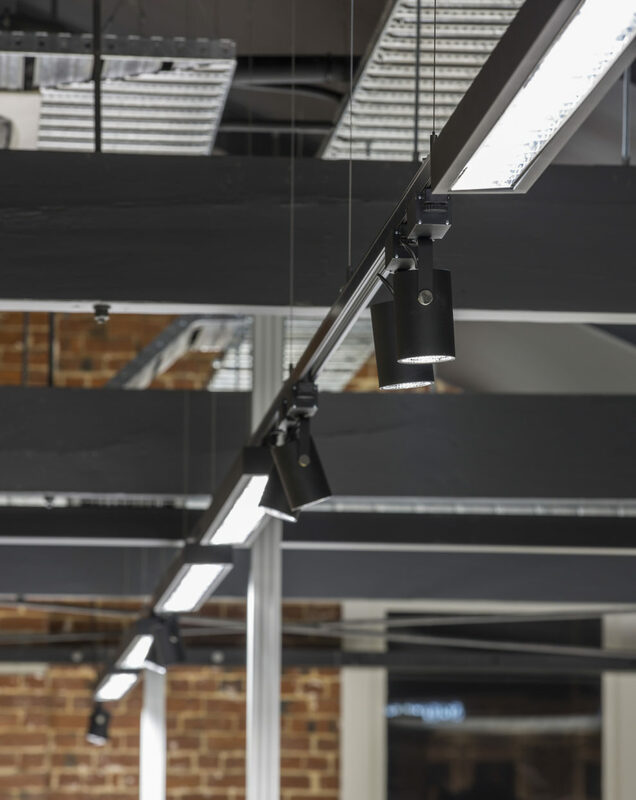 With their double light-lines the Planlicht pendants attract the eye and lessen the impact of the industrial ceiling services above. The architect’s brief called for fun and drama, and fun was provided in the cafeteria and social areas with the OMS Rebell II pendants. 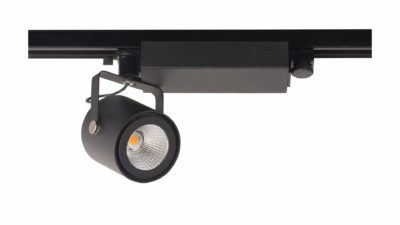 As well as being eye-catching these luminaires provide soft diffuse light that is comfortable for socialising, reading or carrying out work tasks. Pure 2 LED fittings are also used at reception to keep the theme throughout this area, along with horizontal linear fittings recessed into the front of the reception counter. 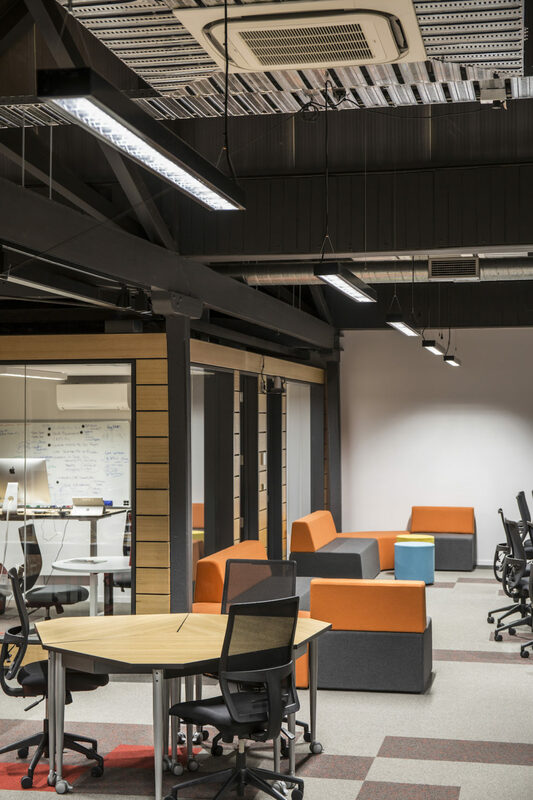 Louvred fittings provided comfortable task illuminance and the spotlights provided additional task lighting where necessary and an element of feature highlighting in other areas. Since its opening in 1894 St Patrick’s Basilica in Dunedin has been a place of worship and a focal point for the local community.